As well as being the first Astronomer Royal, John Flamsteed was also Rector of Burstow from 1684 until his death at the end of 1719. His predecessor as Rector was his grand-father in law Ralph Cooke and his successor, James Pound, the uncle of the third Astronomer Royal, James Bradley. Although Flamsteed died in Greenwich at the Royal Observatory, he was taken to Burstow to be buried, the parish records indicating that he was interred there on 12 January 1720. Memorial plaques etc: 1. East window with brass dedication plaques on left and right beneath. The only known record of exactly where Flamsteed was buried comes from the will of his wife Margaret. No monument or memorial was erected until the 1890s. The astronomers who succeed him at Greenwich began their search for his grave as long ago as the 1790s. And what of Flamsteed? Where is his resting-place and his monument? Must we say that the former is scarcely known, and that nothing in shape of the latter exists? Such is the fact. It is curious that his biographers make scarce any mention of the deposit of his mortal remains. 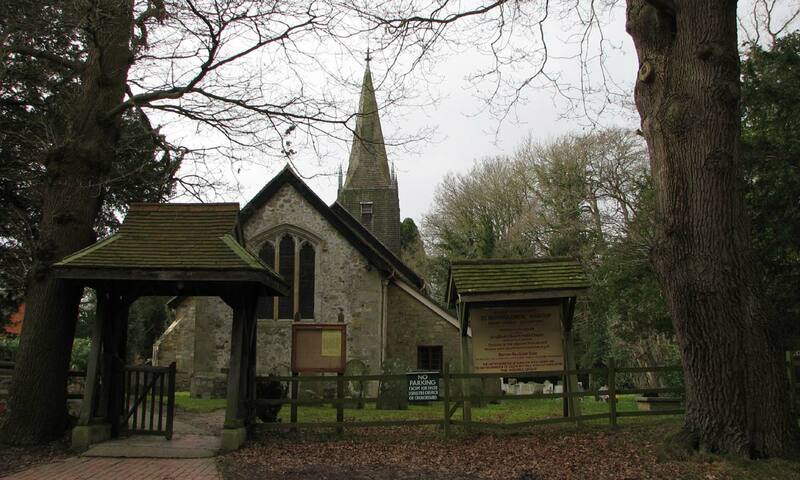 Thinking it most probable that they were interred in the churchyard of the parish of his ministry, we lately visited Burstow, with the hope of finding some tombstone or monument to his memory. We found none. The present rector kindly informed us that there is an entry in the parish register to the effect that John Flamsteed was buried on Jan. the 12th, 1720, and that a tradition exists that he was laid beneath the chancel of the church, beside Dr. Cooke (possibly his father-in-law), but that no monument or tablet has ever existed; not even is his name inscribed upon the stone that covers his bones. Neglected in life, he has been forgotten in death. Yet not quite forgotten; for his name, familiar to astronomers as a household word, has cause to be remembered and revered by a few at least of the poor and needy of his parish. He left to that parish "the interest of 25l. per annum, to purchase two new coats for two poor Christian people; " and his faithful widow, following his good example, bequeathed the like amount, "to buy two new gowns and petticoats for two poor widows." His contemporary, Newton, who owed some of the basis of his fame to Flamsteed’s assistance, has been portrayed, sculptured, and monumented to sufficiency; and the tomb of Halley – Flamsteed’s enemy and successor in office – in Lee churchyard was, some ten years ago, restored at the Government expense. Could not a few pounds be spared from the public purse to erect some slight tribute to our hero’s memory? 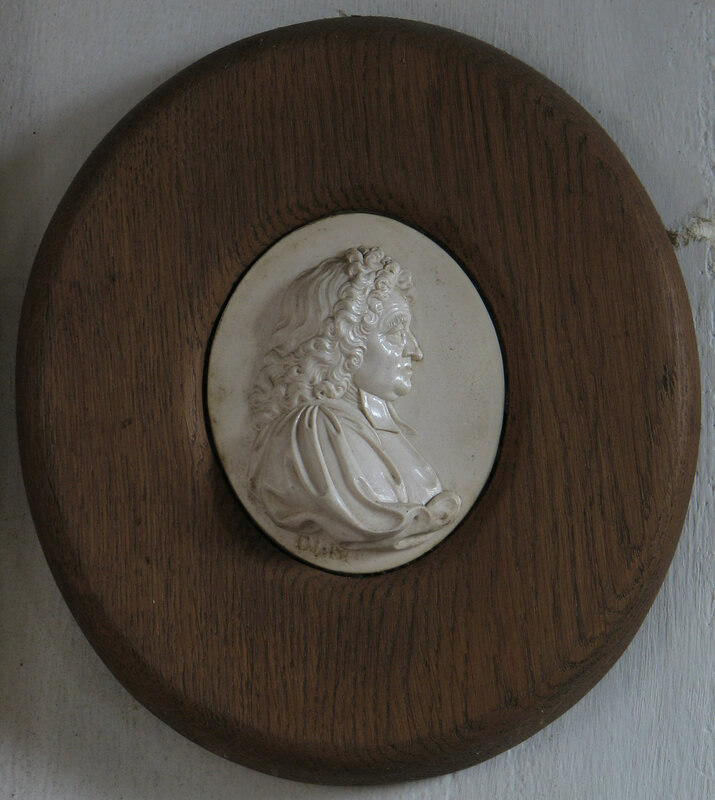 Or, failing that, could not a few shillings be granted to inscribe the name of “John Flamsteed, England’s first Royal Astronomer,” on that blank slab in the chancel of Burstow church? Believing that any circumstances, however trivial, relating to the personal history of the Rev. 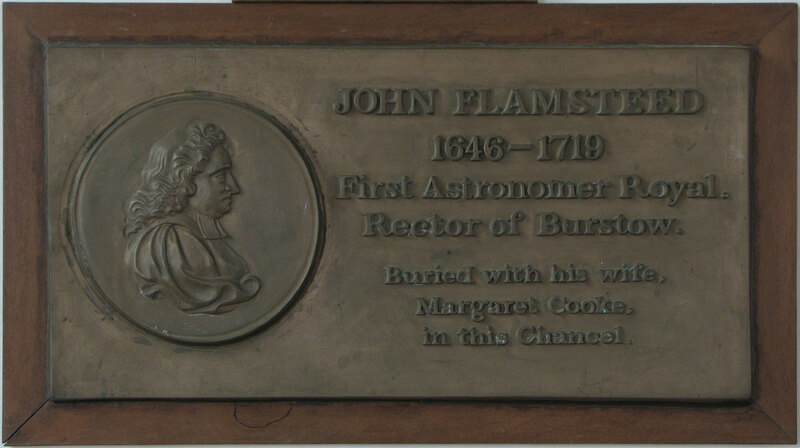 John Flamsteed will be received with interest, I have thought that the readers of the ‘Observatory,’ and astronomers generally, will be glad to be informed of a few facts lately come into my possession, which clear up a doubtful point regarding the resting-place of the remains of the first Astro­nomer Royal. 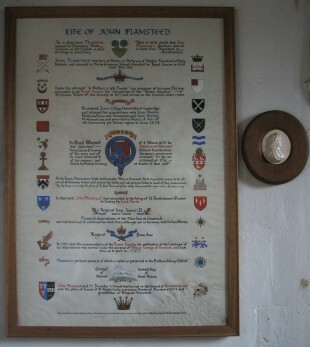 These facts have been gleaned principally from the registered copy of the will of Mrs. Margaret Flamsteed, his widow, now preserved in the Principal Registry of the Court of Probate, Somerset House. Flamsteed died at the Royal Observatory on 1719, December 31; and in the parish register of Burstow, in Surrey, the record of his burial is entered thus : – " 1719-20. Jan: ye 12th. The Revd Mr. John Flamsteed, Rector of this Parish.” Up to the present time there appears to have been some uncertainty as to the locality or his grave, whether it was in the chancel or the churchyard. There was no known documentary evidence one way or the other; but it has always been supposed to be in the chancel; and a tradi­tion, brought down probably from rector to rector, has assigned a place for it there next to that of Flamsteed’s predecessor, Dr. Cooke. Mr. J. Carpenter, in his interesting account of Flamsteed, pub­lished in the ‘Gentleman’s Magazine,’ February–April 1866, com­menting on the paucity of information we possess, remarks: “And what of Flamsteed ? … … but that no monument or tablet has ever existed; not even is. his name inscribed upon the stone that covers his bones." 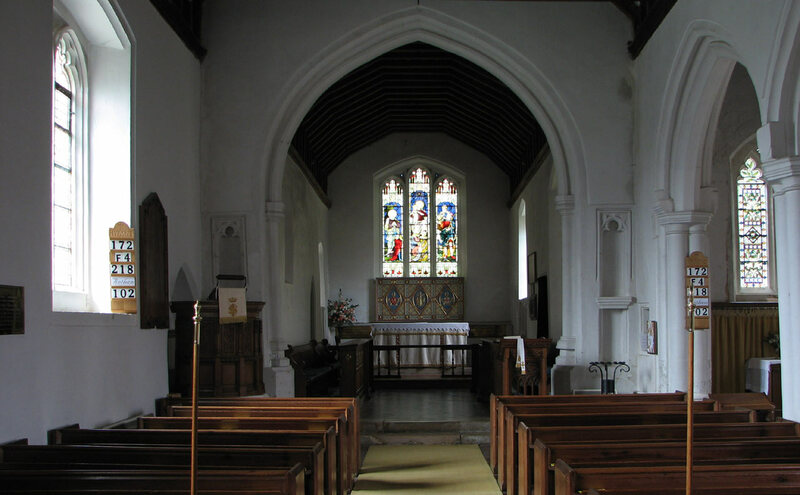 To this interesting statement of Mr. Carpenter, I may add that Mr. Lynn has more recently visited Burstow church, and was in­formed by the present rector, the Rev. T. B. Sikes, that all that is known of Flamsteed’s grave in the parish is, that it is believed that he was interred by the side of his relative, Dr. Cooke, but that there is no memorial of him further than the brief record of his burial inserted in the parish register. Dunkin’s letter to The Observatory was followed up by one from Lynn that was published in November 1886. In this, he stated that at the time when he had visited the church in 1880, the Rector had told him that a restoration of the church was being contemplated. At that time Lynn had wondered if the slab covering Flamsteed’s grave might have been at some point turned over. Work carried out during the restoration indicated that it had not. Indeed a thorough search was made of the chancel when the stones were up, but nothing was found to prove the fact that Flamsteed had been buried there. Click here to read the letter as published. Nothing further happened until a letter was published in The Times on 3 June 1892 giving details of a memorial that was being planned for the American James Russell Lowell in the Chapter House of Westminster Abbey. This spurred, William Tebb, a businessman and social reformer, who had moved to Burstow in the late 1880s, into action on Flamsteed’s behalf. After gaining support from the Astronomer Royal, William Christie, and the Astronomer Royal for Ireland, Sir Robert Ball, he wrote to The Times on 19 August making the point that if a memorial was to be erected to an American at Westminster Abbey, then surely it was time to erect one at Burstow for Flamsteed and that he was proposing that it take the form of a window and a tablet. This provoked a flurry of letters to The Times ( T.E.J. pub. 24 Aug, Dunkin 26 Aug, Pickering 1 Sep and Tebb 20 Sep). In his second letter, Tebb was able to announce that the project was going to be put before the Royal Astronomical Society at their first meeting in November and that members of the public wishing to contribute should get in touch with the Rector of Burstow, the Rev R E Snepp) who had kindly promised to act as treasurer. In the meantime, Tebb’s original letter and that from T.E.J were republished by the editors of The Observatory (click here to read). A few weeks later on 26 October 1892 Tebb was nominated by Maunder (another assistant at the Observatory), seconded by Maunder’s eldest brother and elected on 30 November as a member of the British Astronomical Association. (Journal of the BAA). Some months ago Mr. William Tebb, of Rede Hall, Burstow, Surrey, called attention to the fact that Flamsteed, the first Astronomer Royal, had no monument to his memory, neither at his birthplace, nor at Greenwich, nor at Burstow, of which parish he was rector for 35 years. This is the more remarkable as his wife, Mrs. Margaret Flamsteed, left a sum of money for the express purpose of providing a monument to him. In consequence of Mr. Tebb’s suggestion a committee has been appointed by the Royal Astronomical Society to receive subscriptions, and to decide on the form which the memorial should take. The general feeling at the Annual Meeting of the Royal Astronomical Society was that a medallion portrait, or bust, with a suitable inscription would be the best form. 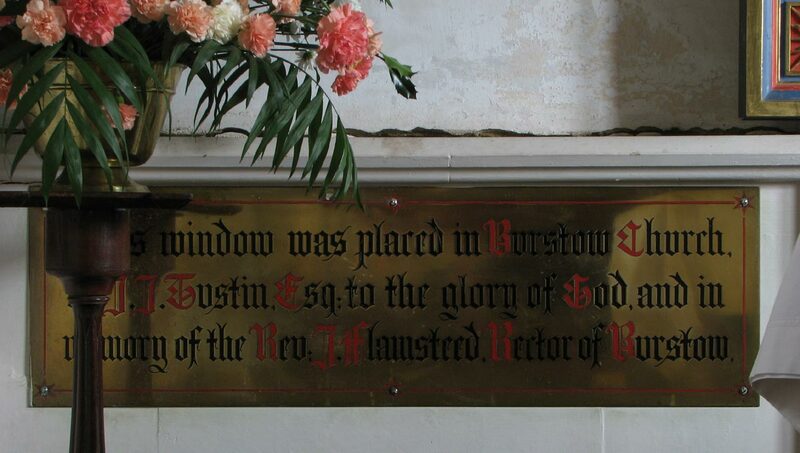 In the meantime Mr. [Jesse John] Tustin, a resident at Burstow [Burstow Hall], has at his sole expense, beautified the little church at Burstow by supplying a stained glass window at the east end of the church, with an inscription to Flamsteed’s memory. 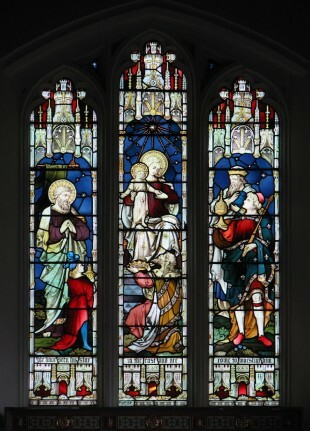 The window represents the Adoration of the Magi, the star shining above the centre of the group. 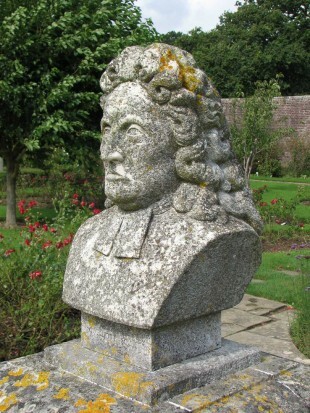 This gift is, however, quite apart from the general project of the Flamsteed Memorial, and it is to be hoped that the example of this private generosity will lead to prompt and earnest action that one who did so much for our science, and who met with such poor recognition in his own time, may at length be provided with some appropriate memorial. 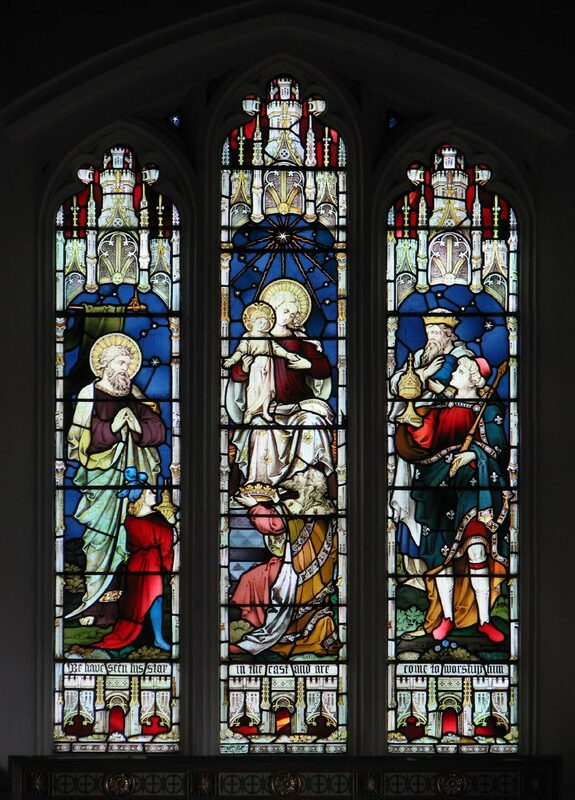 That this Committee, understanding that a memorial window to Flamsteed has already been erected in Burstow Church, does not recommend any further action at Burstow. That the Committee considers that it is desirable that a suitable memorial to Flamsteed be erected at the Royal Observatory Greenwich. It was then resolved that before taking any further action that the above resolutions should be communicated to the Admiralty ‘enquiring of them what they are prepared to do in the matter’. My lords desire me to request that you will inform the council that they are informed by the Astronomer Royal that he is of opinion that the question of considering the erection of any such memorial had better be deferred until after the completion of certain buildings now in progress [the New Physical Building]. 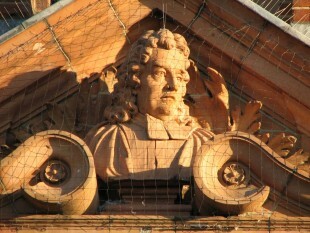 It is surmised that the whole sorry saga influenced the inclusion of the bust of Flamsteed that not long after was placed over the front door of the New Building at Greenwich as part of a wider decorative scheme. An entry in Christie’s journal for 5 November 1894 (RGO7/30/26) states that ‘ Mr J Raymond Smith, sculptor called to arrange about bust of Flamsteed for N. wing of Physical Observatory and took away ivory medallion and engraved portrait of Flamsteed on loan’. An examination of the papers in RGO7/50 may shed more light on this. Burstow did eventually get its medallion of Flamsteed with an English inscription – but not until the tercentenary of the Observatory in 1975. We learn from the The Royal Greenwich Observatory Report for 1975 January to September that the parish of Burstow held a Flamsteed Festival during the summer and that Dr. Hunter (the Observatory’s Director) spoke on the astronomical significance of Flamsteed’s work at a memorial lecture on 6 July, and read one of the lessons in Burstow Church at a Service of Thanksgiving on 13 July, when the Bishop of Kingston conducted Evensong and dedicated a new memorial tablet to Flamsteed. We further learn from the Journal of the British Astronomical Society, Vol. 87, p.443 that it was mounted on the South wall. 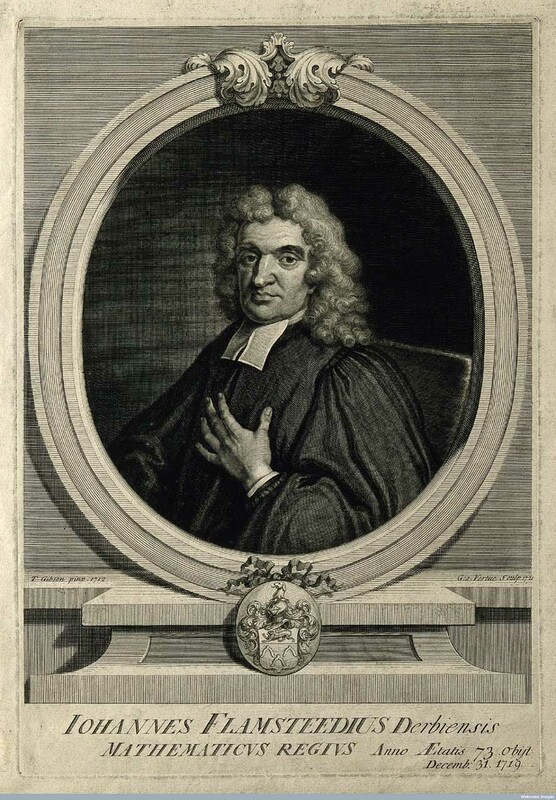 On the tercentenary of Flamsteed’s death in 2019, perhaps the time will be right for a memorial to him to be erected in Westminster Abbey where the astronomers Jeremiah Horrox, Isaac Newton, Edmond Halley, John Couch Adams and William and John Herschel are already commemorated.